This one was fun. I used a compass to draw the overlapping circles and a triangle to draw the spikes on the mace balls. I penned the two converging lines and their parallels. I used latex frisket to draw the squiggles and to mask against the blues. I like the cartoonish quality of this work. 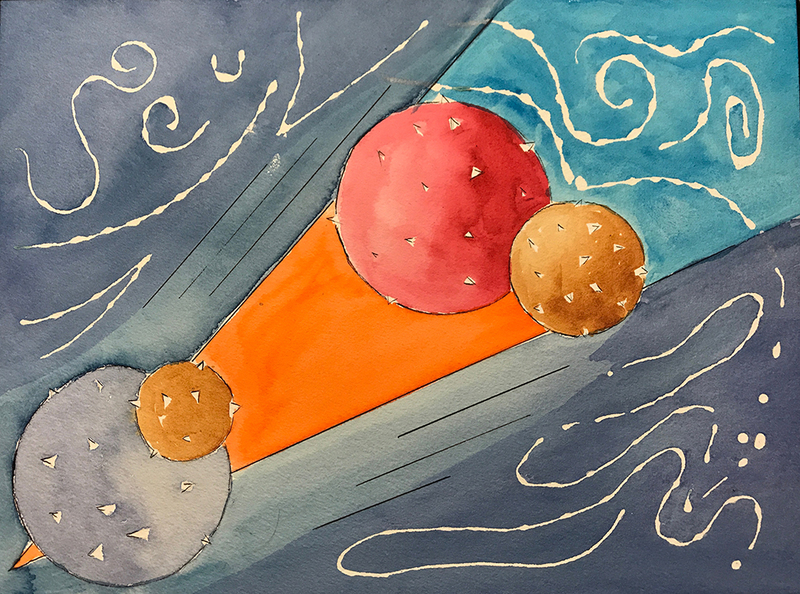 This entry was posted in Personal Stories and tagged abstract art, arrows, art, artistic process, creative process, creativity, mace, painting, visual arts, watercolor. Bookmark the permalink. This one – well, I just love it. The spiky balls are fantastic and the hard shapes contrasted with the flowy paint. Thank you, Claudia. It was a fun piece to do. Kandinsky was in the back of my mind, with circles and angles.